Happy Valentines Day! I make these every year for Frank, super-cheap and his favorite V-day treat. These are a no-brainer, so delicious and a perfect dessert option for a big dinner party or just a weeknight. All you need are stawberries and chocolate chips. Plus, they store and save really well. In a small saucepan on the lowest heat setting, melt the chocolate chips, stirring constantly with a wooden spoon. 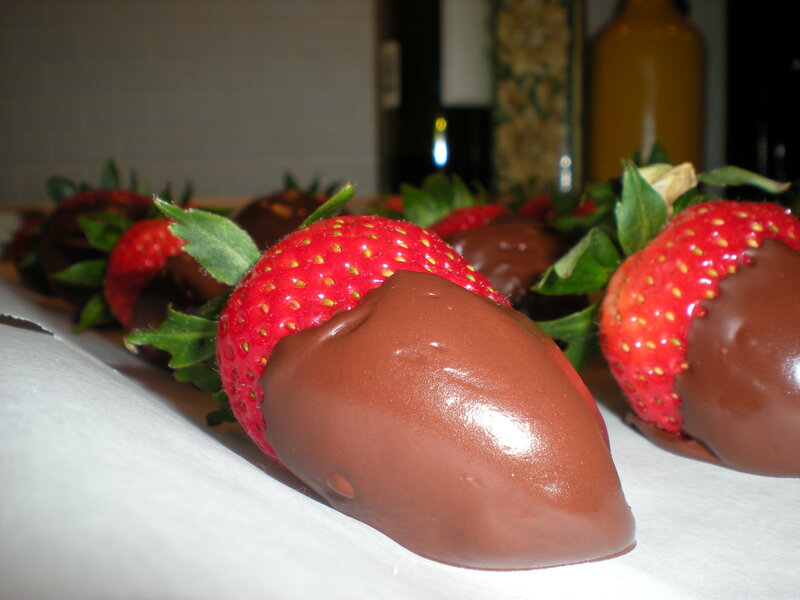 Once melted, dip the strawberries into the chocolate, twisting on the way out to keep the chocolate from dripping. Place on a cookie sheet lined with parchment paper. Refrigerate for an hour or until the chocolate hardens. *If you like white chocolate, you can melt a little of it in the small way and use a fork to drizzle melted white chocolate over the chocolate-covered strawberries for some extra pizazz.